You mentioned 63k income that you can spend, but I don’t see you including principle payments. Wouldn’t that cut into your cash flow? You’ll need to go back and read the three-part article, but this question goes to the heart of whether to pay off your mortgage, and is somewhat the same argument whether you want to do this on an investment property or even your own home. The building that I was looking at buying would have generated $255k in rents – $192k in expenses (including $130k bank interest) = $63k net ‘profit’ p.a. But, when you do the math, it can lower the % return that I am getting on my money. … whereas, an investor should generally be looking to increase their % returns. 1. Putting it into this property to pay it off quicker? 2. Putting it into my home mortgage to pay my home off quicker? 3. Putting it into another $100k property that I can buy with 20% down? In order of decreasing return, it’s generally 3. then 2. then 1. I know which I would rather do. How about you? This entry was posted in real estate and tagged 7million, 7million7years, Investing, real estate, Saving by Adrian. Bookmark the permalink. I wish I’d known this stuff when I was living in a country where one could get multiple mortgages! In China you have to put down 30% for your first mortgage, 60% for the second one, and then there’s no further. From then on , you buy property 100% cash. If you offer property as security on any other form of loan, it has to be 100% free of any other debt burden – so you cannot even use a paid property to secure payments for deposits on two other properties (unless you fraudulently misdeclare the purpose of your loan). And then rental income is generally less than 1% of the capital invested. (RMB 1mil of property will give you RMB 2 500 per month rent residentially, or RMB 5 000 odd if it’s a business property). The capital growth, however is phenomenal. Our apartment’s value doubled in a year, if comparing it to the price that a similar one just above us sold for recently. If it’s a guaranteed rate of return on the non-principal payment, then it would make sense to go that route. Unforunately, many of the things that people claim are ‘better’ investments aren’t guaranteed, and can actually lose you money (ie the stock market). Plus, peace of mind of not having that payment is often ‘worth’ something to many people, a number that has to be added to the rate and is something that each person has to decide for themselves. I look at it that if you’re working to increase your net worth by smartly increasing your assets and/or decreasing your debt, there’s no wrong in that. Having lived through a couple of downturns, I have to agree with Money Beagle here. Your approach makes perfect sense when it comes to maximising the upside but carries a degree of risk. 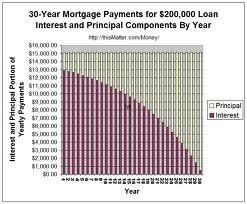 Those interest only mortgages are typically for short terms (3-5 years depending on where you live) and need to be rolled over on maturity. A combination of lower valuations, higher interest rates and/or few vacancies can be a fatal combination – as happend in many places in Hong Kong 1997-2003, Australia under Keating, the US in the early 1970s and the GFC, several countries in Asia in 1997 etc etc. My own approach is to go for long term (20 years is the best I can do here) P+I. I may not be getting the best bang for my buck on the leveraging and have to put down a bigger deposit to get positive cash flow, but I sleep better at night knowing that each month that goes by makes my position a little more secure. @ Ashton- with such poor leverage available in China, it’s not the capital growth that you should be shooting for … it’s high returns i.e. income from rents. @ traineeinvestor – there is nothing intrinsically wrong with interest-only mortgages; it’s the level of starting equity that you hold that determines your risk, under your equation. Even then, it’s moot if you don’t sell (as long as your property is cashflow positive). 3, 3, 3, 3, 3, 3, 3, and then maybe 1. This has been my approach now for several years. Each time though, there is a period of internal strife because culturally i have been raised to believe, “you are what you own not what you owe” and getting more debt goes against that certain core upbringing. Fortunately, I quickly move on…and pull the trigger. @ Luis – this is still a ‘truism’ … it’s the same today, whether you buy a $100k asset for cash or a $1mill. asset for $900k down.